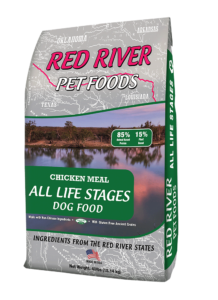 Red River Dog Food is now available exclusively at your local Farmers Coop and Noah’s Pets and Wild Birds. These all-natural, non-Chinese ingredients are locally sourced from Red River states, creating a quality formula that’s specialized just for your canine companion. All formulas contain no corn, soy or wheat and are gluten-free. We’ve got three formulas to choose from. Chicken Recipe for All Life Stages – The classic chicken recipe is suitable for all dogs, regardless of life stage. Classic Chicken recipe is packed with vitamins, minerals, and essential nutrients to keep your dog in peak health at any age. Chicken & Pork Meal Athlete – This dog food is specially formulated for athletic pups, working dogs and hunting hounds that require a little dietary help to fuel their energetic lifestyle. Athlete formula offers key ingredients like Glucosamine and Chondroitin. This combination has been shown to increase joint health while higher animal protein and fat content help boost energy levels. Pork & Catfish Recipe Maintenance – If your canine companion needs a little help with maintaining it’s weight this formula is a great start. In addition to helping promote healthy activity levels, it’s a wholesome combination of lean pork meal and locally caught Red River catfish. This entry was posted on Thursday, December 21st, 2017 at 9:24 pm	and is filed under Dog, News & Updates. You can follow any responses to this entry through the RSS 2.0 feed. Both comments and pings are currently closed.